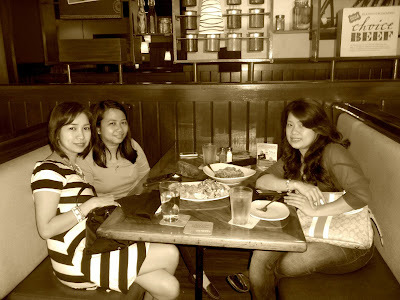 Just last week, about two days before my trip to Hong Kong, I met up with C and J in Glorietta for a brunch get-together. Also, J recently celebrated her 18th birthday so this is a special brunch for us. I can't remember the last time I ate at Outback but I'm pretty sure that it was at the Glorietta branch also. We were the first ones inside since the restaurant just opened its door for the day. I wanted to sit near the window but was voted against it because the sunlight might ruin our photos. Haha. Ceasar Salad with Spicy Shrimps. I love the romaine lettuce and the dressing and the slivers of cheese. Perfect blend! The shrimp was not too spicy, thankfully and it tasted good with the salad. Buffalo Wings. I almost didn't eat this because I've already eaten more than my usual amount of chicken but I can't resist especially when C and J mentioned that it was delicious. So I had about three helpings of chicken wings and a stick of celery. And my friends were right because the chicken was indeed delicioso. The chicken's hint of spiciness will make you crave for more bite instead of asking for water. Amazing! That's J with her molten chocolate cake ala mode. Happy 18th Birthday !!! Cheers !! !